The Singapore Internet Backbone (SIB) was a tri-lateral peering agreement that transformed Internet connectivity in Singapore. In 1996 there where three licensees Internet providers. Each of the providers was aggressively competing with each other within Singapore and within the region (working to connect ASEAN through Singapore). Connectivity within Singapore was haphazard and not efficient. 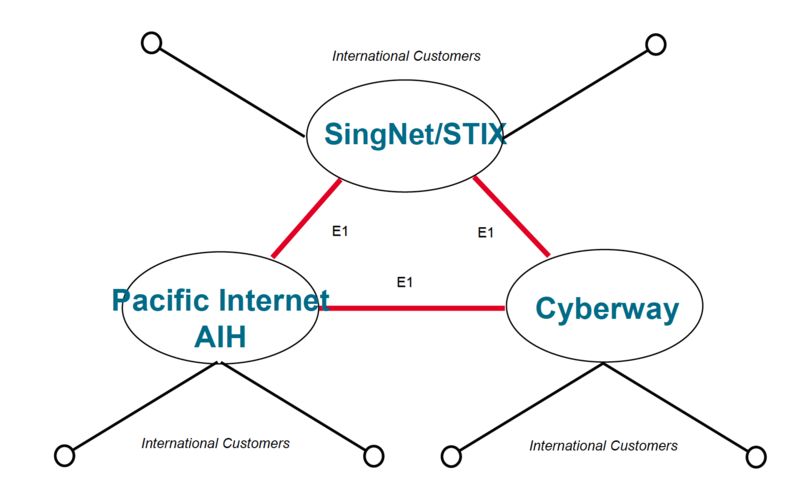 The Singapore Internet Backbone was a result of the key ISP leadership at SingNet, Pacific Internet, and Cyberway informally working out a functional model of peering that scales, meets the needs of their customers (fast – low latency connectivity), keep each company’s shareholders happy (i.e. allowing for aggressive competition), and meets the national objective of Singapore as a regional Internet hub (the regulator’s objective). The informal agreement was turned into a formal agreement and announced via a press conference on May 9th, 1996. SIB is a model of Service Provider collaboration – for the best interest of their customers and the profitability of their customers.